Rebecca Taylor's high waisted skirt ($274) looks great and the big belt included keeps the look fresh. 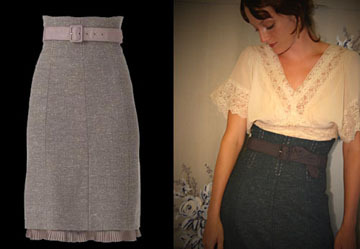 This look is definitelly coming back (think 40's -- see my previous post) and I love the soft feminine feel. I have a vintage high waisted skirt I bought years ago at a vintage fair for only $10 (in black wool) and I'm actually going to find a way to wear it this fall. The belt is definitely the key to the entire look. Here's the preview for this Wednesday's Project Runway. This week's challenge is to design for a hip, international jetsetter and I love that Kayne thinks automatically of Tara Reid. Also here's fourfour's recap from last week of Robert's goodbye. 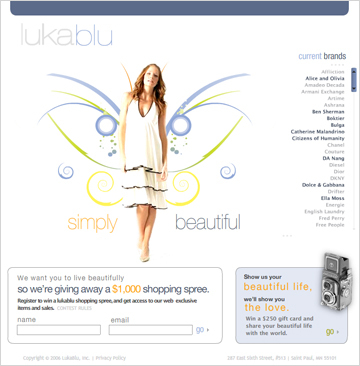 Lukablu is a new site launching this fall that is focused on making the web site just as beautiful as all the clothes. With their launch they have a photo contest called "My Beautiful Life" that is open to all contributers. The most intriguing entries will win a $250 gift card to the site and will have their photos featured on the home page. You can see all the entries that have been submitted so far. Really some amazing beautiful stuff there. The list of brands they have on their site already is making me more curious as to what it will look like in November. Finally this may be what I've been waiting for -- a good convergence of fashion and digital style. Right now mailboxes are being stuffed with fat magazines like Vogue and Harper's Bazaar with all the cool fall looks. The only fashion magazine I'm looking forward to is the September issue of British Vogue with Kate Moss on the cover. Both British Vogue and British Elle are the best. Thanks to my friend Susan for getting me on to this tip a few years ago when we were in Europe. I've found consistently more style and fashion than most of the American fashion mags which were so Hollywood focused. Perfect example is the September issue of Vogue with Kirsten Dunst as Marie Antoinette on the cover. Can you believe it? Where's the fall fashion in that? Looks like a big o' movie plug to me. Thankfully, we have fashion with Kate Moss as she celebrates her 23rd cover with the magazine. You can see all of Kate Moss' British Vogue covers here. Here's a preview for Wednesday's Episode 7 of Project Runway. I hope Michael doesn't get the Daniel V curse of winning so many runway competitions but not winning the final show. Also, if you haven't already, you need to read FourFour's epsode recap after each episode. Here's her recap of Alison's kick off in Episode 6. This question made me realize the importance of where the fashion bloggers live, since weather is so much of a factor in what we wear. It's amazing to find so many talented fashion bloggers all over the world. - The Perfect Closet is eyeing the classics for Fall, with Burberry's must have trench coat but she'll miss her Nanette Lepore's Senorita top. - Stiletto Jungle moved up to San Francisco from warm San Diego and will miss her Mia "Gwen" wedge espadrilles, but is going to look super hot in foggy weather here in the Robert Rodriguez mohair cropped sweater. - Nancy Friedman got her Bolo ankle boots for 75% off retail at Zappos.com and after our Indian summer this fall is looking forward to wearing them in November. - The Runway Scoop's Maria gets nice weather year round in LA so she doesn't have to abandon her summer wardrobe. She's going to look even hotter this fall with the black patent leather peep toe heels. - Miss Janey's Place will miss her Steve Madden espadrilles but she's looking forward to replacing them for some knee high boots. - The Space Between My Peers is going to miss her wedge sandals but give us all the best advice to head to our favorite store and buy a blazer in the latest trendy color cycle teal, cyan, or muted blue. - Stylefinder looks smashing in her Dru Design strapless stress and is looking forward this fall to head over to Anthropologie to get herself the Navigator coat. - Fashion Outlawcomments that "I suppose said jacket is going to be the thing I covet for fall, because the clothes I don't have yet are always more interesting than the ones I already have." So true! - The Bargain Queen survived winter in Sydney and is now gearing up for Spring. She's looking forward to some open toed shoes! - Fashion is Spinach (love the name!) is wearing the cutest floral print summer dress. She's looking forward to donning more vintage gear this fall -- see her pick! Hello fashion bloggers! Thanks to Designer Ella, The Bargain Queen, and Manolo for letting me host this round of Carnivale of Couture. I am very excited! Anyone can participate in this. Post your answer on your blog and send me a link to it in the comments of this post by Sunday night, August 20. Your links and summaries will be posted here on Coquette on Monday, August 21st. When summer ends I will deeply miss my BP gold wedge sandals. It gets cold here in San Francisco and this summer its been a treat to have abnormally hot weather so I've been getting more wear out of these. For fall, I'm on the search for a nice coat and came across this Marc by Marc Jacobs coat at Saks Fifth Avenue (yes the day I bought my Vince sweater). This coat is so comfortable and stylish. I like that it follows a woman's silouhette and gives you a nice shape when usual winter coats make you look bulky. I can't help but love Marc. This coat just looks timeless. A little Project Runway vent. I can't believe Alison got kicked off for 1 bad design, when Vincent consistently does the worst stuff. But he makes good TV since he's so quirky right? This is so sad! I'd wear Alison's designs any day. Her exit video is so sweet. (Click on "Adios Alison on bottom right"). Her episode 3 outfit was my favorite with the story of a Japanese fashionista. So this is the reason my postings on Coquette have been short the last week or so. If some of you don't know already, my day job is working for CRAFT magazine as an editor. 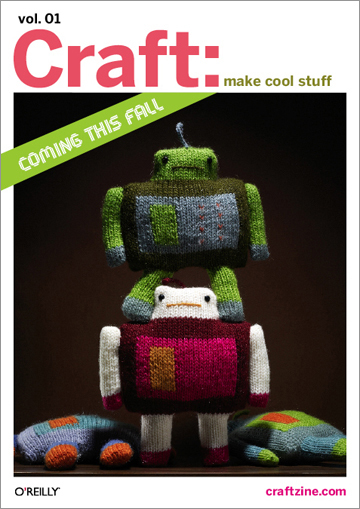 CRAFT magazine is a new magazine from the creators of MAKE magazine that celebrates the DIY spirit. The first issue covers over 20 projects you can make yourself including knitted boots, iPod cozies, crochet robot, needlepoint bracelets, and more. There are special features and crafter profiles like embroidery queen Jenny Hart and another one on fashion tech designer Diana Eng (written by me). 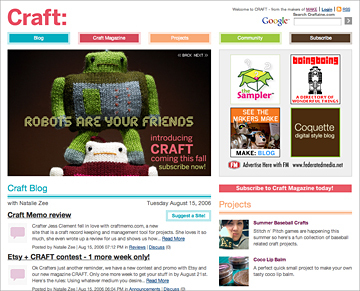 I'm also the web designer for makezine.com and the newly launched craftzine.com, the online companion to the magazine. I've been working like crazy with the team to get everything done and looking good. I hope you all like it! I'll be posting daily to the CRAFT blog so add it to your bookmarks or RSS feeds. Things have been super busy but I hope to let you know soon what's happening! For now, another great Project Runway preview, this one focusing on Michael. I think Michael just may be my favorite and I'm so glad he won last week. I know Kayne's Marilyn dress was amazing but I just though Michael's design was so modern and fresh, yet totally channelled Pam Grier.